It’s shaping up to be a beautiful week in State College, fitting weather for the campus-wide good vibes still lingering from Saturday night. I took my 5-year-old to Beaver Stadium, and after the game I told him that one day he’d be able to tell his kids about seeing Joe Paterno win his 400th game. Honestly, I don’t think he grasped it; all my son knew was that he had a blast high-fiving our neighbors in section NAU over and over again in that second half. 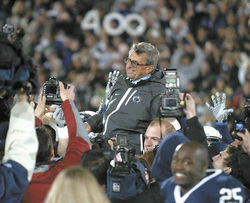 –This wrap-up from the Altoona Mirror is cool for the embedded video link, which offers a close-up view of Paterno on the shoulders of lineman Eric Shrive and graduate assistant coach Gus Felder ’02 (who I’m pretty sure was on the field as a player when Joe broke Bear Bryant’s Division I victory record back in 2001). It offers a great sense of the noise and energy on the field at the end of the game. -Rich Scarcella ’81 of the Reading Eagle does a great job pulling in perspective from some of Paterno’s former players, including Bobby Engram ’95 and John Shaffer ’87. -Dave Jones of the Harrisburg Patriot-News offers a different sort of perspective from field level at Beaver Stadium. It’s a great read. The women’s soccer team needed a dramatic goal in double overtime Sunday to beat Michigan, earning a share of its 13th straight Big Ten championship. That streak breaks the conference record for longest run of league titles in any women’s sport. The men’s soccer team earned the No. 4 seed in the Big Ten tournament, which the Nittany Lions will host this week at Jeffrey Field. Penn State opens the tournament Thursday afternoon against Northwestern. Basketball season got underway over the weekend, with the Nittany and Lady Lions hosting exhibition games. The men beat East Stroudsburg, 66-52, on Sunday afternoon, while the women posted a 91-58 win over Gannon. Both teams start playing for real on Friday night. And while Penn State’s varsity hockey teams won’t suit up for a couple more years, their future home got a little closer to becoming reality on Friday when the Board of Trustees announced the choice of architects for the new hockey arena. Entry filed under: Uncategorized. Tags: Altoona Mirror, Bobby Engram, Dave Jones, Gus Felder, Harrisburg Patriot News, John Shaffer, Men's soccer, Northwestern, Reading Eagle, Rich Scarcella, Women's Soccer.